One of our first statewide leadership meetings, in the Spring of 2014. 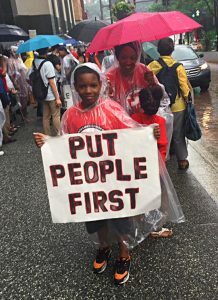 PPF-PA was founded in June 2012 by a group of Pennsylvanians from rural, small town and urban areas who have a long history of bringing people together to find solutions to the problems that we face — in the school system, in the workplace, or in the effort to make ends meet. 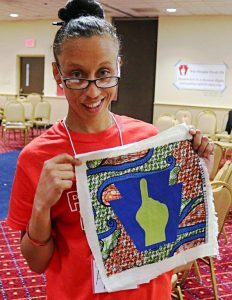 The founding members were also rooted in struggling communities across the state, and saw an absence of organizations committed to building enough power in PA to fight for and win changes on a statewide level. We started by making a spreadsheet of everyone we knew in all 67 counties in the state and by having dozens of conversations. Everyone we talked to told us that a movement to unite across the state for our human rights was absolutely necessary, which gave us the courage and resolve to move forward. Put People First! 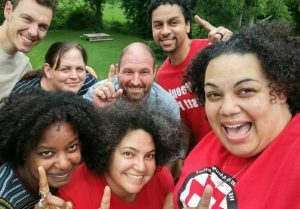 PA has 10 core strategies that form our overall organizing model. We adhere to these points to unify our approach to making change. We, all of us poor (whether working or not) and dispossessed people are the vast majority all over the world. Ultimately, we have the power if we are united. We do not believe that we will convince those currently in power that we are right, nor can they be persuaded by moral arguments. We will prevail through organization – and the development of committed, conscious, clear and competent leaders. In the words of Frederick Douglass, “Power concedes nothing without a demand. It never has and it never will”. Our focus is on organizing the unorganized by base building. We build permanently organized communities. We make the invisible root cases of our conditions visible through education and action. For us, everyday people – not ‘experts’ – are the leaders. Leaders are not born, they are developed. Everything we do, we do to develop leaders. We are transformational, not transactional. Our organizing practice respects the whole person and the whole family. Our basic needs are our human rights. We use a human rights framework and five principles – universality, equity, accountability, participation and transparency, to guide our work and our organization. We are politically independent and we hold all power holders accountable. We build leadership across difference – meaning our leaders are skilled at undermining oppression while uniting the majority across difference. We create own our own narrative and change dominant stories that prop up the status quo. 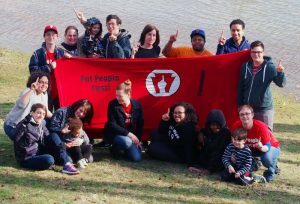 We build solidarity across organizations and movements. We show up for all struggling and oppressed people. We engage in grassroots fundraising, because funding our work ensures that we are accountable to our members and can set our own agenda. What do we need to live healthy, fulfilling lives? We need ways to provide for ourselves and our families that don’t harm other people or the planet. We need quality healthcare, education, and housing. We need healthy food, and a healthy environment. We need transportation and the ability to move and migrate on our own terms. These are the things we need, but the only way we can ensure we get them is to organize together around the strong belief that these are our rights. Our rights have always come from struggle. We believe that the systems we develop to ensure people’s needs are met should meet five basic principles. If any of these aren’t met, neither are our human rights. Universality: Everyone in, nobody out. Equity: Everyone contributes what they can and gets what they need. Transparency: All information related to decision-making should be clear and accessible to all. Accountability: The people are able to oversee and guide how the government is protecting and fulfilling our rights. Participation: Everyone has a meaningful say in how decisions get made that impact us all. We strongly believe that in order to have a fighting chance to win our human rights, everyone who is forced to live on terms and conditions not of our own choosing has to come together. The ways that we’ve been taught to think about race, immigration, and gender can get in the way of us coming together. In this century, we need grassroots leaders who recognize that diverse communities are impacted in different ways by the same root causes. We must replace outdated ideas with new ones that pave the way for us to clearly see each other as well as our common interests. We have a better chance of meeting our needs by working together than by competing against each other or excluding each other. We need leaders who can draw on our different histories, experiences, cultures, and identities for strength and resilience. PPF-PA helps provide education and training for these critical tasks.